December release day for Doodle Pantry. There are so many things going on at Doodle Pantry, especially for the first week. Check out all of the awesome stamp sets released this month, along with more SVG cuts! BIG SALE from now until December 3. Take 40% off your entire purchase (excludes bundles and fundraising sets). Use code TDAYSALE to get your discount. Also, click here to read all about the Doodle Pantry Rewards Program. Don't forget to visit Doodle Pantry's Blog at noon to join in this month's challenge. The featured set this month is Goose Me, which was previously sold at CDS. 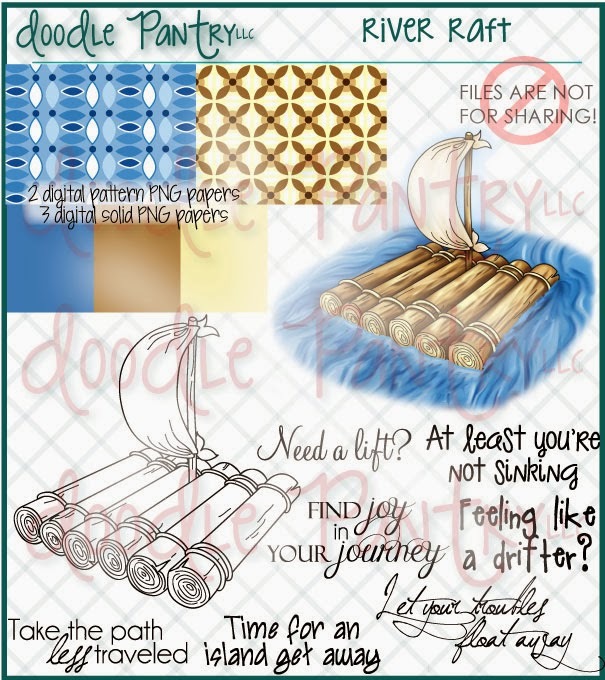 You can only receive this set for free if you use a Doodle Pantry image. You are allowed to use any image for the challenge to win the gift certificate. Ahoy matey, such a fearsome pirate on the high seas and that box of loot looks very rich. Thank you for sharing your lovely project with us this week, we love seeing your art. Such a fun card and lots of sparkle and bling. 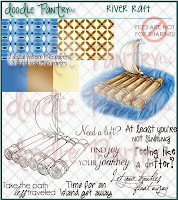 Thank you so much for coming over and joining in with our Challenge #3 'Sparkle and Bling' CraftyHands Challenge Blog. Such an adorable card! So perfectly colored. :) Thanks for joining us over at the Simon Says Stamp Wednesday Challenge this week! Cute, cute, cute!! When I saw the River Raft set @ Doodle Pantry I said to myself, "self, I bet Susan will be using this set"...and I was right. What a cute card. The bird pirate is just adorable. Thanks for sharing at Seize the Birthday. Oh My Goodness.....love it!!!!!! I will have to surely cas this in the future for the summer! Made me smile! You are doing some fabulous work Susan...you are so talented! Love that little bird pirate! Thanks for linking this wonderful card up with us over at Seize the Birthday! This is such a fun card!! That birdie is perfect with the raft!! Super cute - love the sentiment. Great image! Thank you for sharing with us at Wags 'n Whiskers! Lovely card with a cute image. Thanks for sharing with us at Fab'n'Funky this week. How adorable this is, Susan! Just the sweetest card ever. Thanks SO MUCH for stopping by to share your time and talents with us. It means a lot to us to have you share and play along, and I really hope you will stop by again soon. I look forward to seeing more from you,. Thank you so much for joining us at Delicious Doodles for our challenge. Fantastic job combining the images, Susan! Terrific coloring and design. Now, time for me to put on a DT hat to say "Thanks for playing at Delicious Doodles this week." This is so adorable! What a fabulous idea to combine the raft with pirate! What a wonderful creation! Such a cute image!! Great choice of papers too. Thank you for joining the crafty Girls Challenge, hope to see you again soon. Fantastic card, love the merging of the images! AWA! this is soooooo cute. love the image and coloring is super.... Happy New Year.